On April 27th, Drug Enforcement Administration , with support from public and private agencies like MAO around the country, will give the public its 17th opportunity in nine years to prevent pill abuse and theft by ridding their homes of potentially dangerous expired, unused, and unwanted prescription drugs. 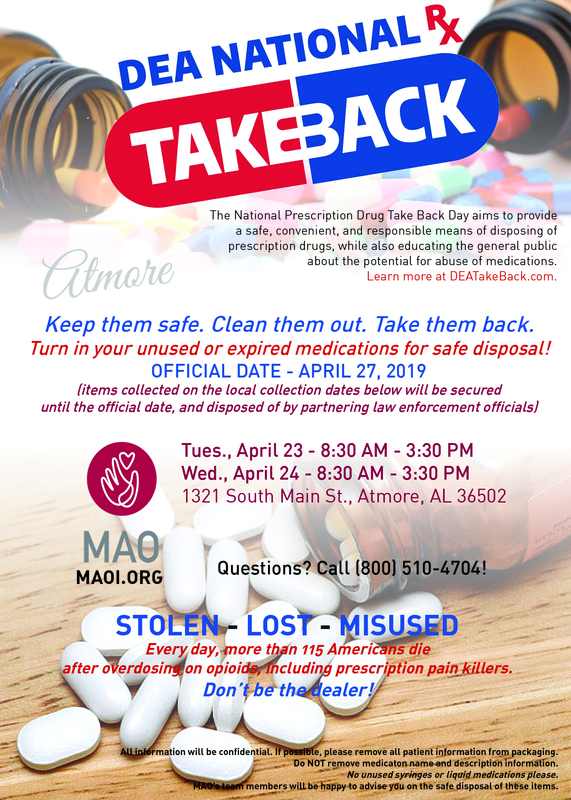 In preparation for the official take back on April 27th, MAO will be supporting the cause with the following collection days in Atmore. Bring your pills for disposal on the designated days. All information will be confidential. If possible, please remove all patient information from packaging. Do NOT remove medication name and description information. No unused syringes or liquid medications please. MAO’s team members will be happy to advise you on the safe disposal of these items. Following collection, MAO’s partners from local enforcement agencies will assist with the proper disposal of all collection items.